The transformation of water into wine at the Marriage at Cana or Wedding at Cana is the first Miracle of Jesus in the Gospel of John. In the biblical account, Jesus and his disciples are invited to a wedding and when the wine runs out. Jesus turns water into wine by performing a miracle. Contrary to current mainstream Mormon belief, Mormon leader Orson Hyde taught that the Marriage at Cana was Jesus’ own wedding, that Jesus was a polygamist and that the sisters Mary Magdalene and Martha were among his wives. This teaching has never been accepted as part of official Mormon doctrine by the Church of Jesus Christ of Latter-Day Saints and is not held to be true by the overwhelming majority of Mormons today. Anti-Mormon critic Floyd McElveen argues against this hypothesis based on John 2:8-10 which states that the master of the ceremony at the feast (unaware of the miracle) congratulated “the bridegroom” for the wine, not Jesus and that John 2:2 states that: “Jesus and his disciples had also been invited to the wedding”, and one does not get invited to his own wedding. On the third day there was a wedding at Cana in Galilee, and the mother of Jesus was there. Jesus also was invited to the wedding with his disciples. When the wine ran out, the mother of Jesus said to him, “They have no wine.” And Jesus said to her, “Woman, what does this have to do with me? My hour has not yet come.” His mother said to the servants, “Do whatever he tells you.”Now there were six stone water jars there for the Jewish rites of purification, each holding twenty or thirty gallons. Jesus said to the servants, “Fill the jars with water.” And they filled them up to the brim. And he said to them, “Now draw some out and take it to the master of the feast.” So they took it. When the master of the feast tasted the water now become wine, and did not know where it came from (though the servants who had drawn the water knew), the master of the feast called the bridegroom and said to him, “Everyone serves the good wine first, and when people have drunk freely, then the poor wine. But you have kept the good wine until now.” This, the first of his signs, Jesus did at Cana in Galilee, and manifested his glory. And his disciples believed in him. 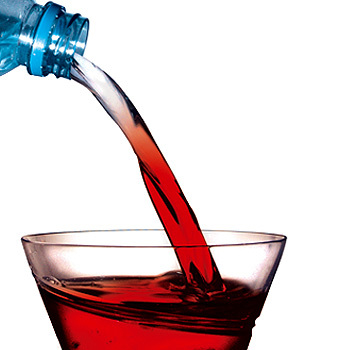 GotQuestions: Did Jesus turn the water into wine or grape juice? Christian Apologetic and Research Ministry: Is it okay for Christians to drink alcohol? Whether one wants to believe the Holy Bible for what it says (unlike most Baptists I know), the fact is that Noah and the Wedding Guests at Cana were drinking alcoholic beverages. The Apostolic Fathers make very little reference to wine, but the earliest references from the Church Fathers make it clear that the early church used wine in their celebration of the Eucharist, often mixing it with water according to the prevailing custom. The Didache, an early Christian treatise which is generally accepted to be from the late 1st century, instructs Christians to give a portion of their wine in support of a true prophet or, if they have no prophet resident with them, to the poor. Clement of Alexandria wrote in a chapter about drinking that he admires those who adopt an austere life and abstain from wine, and he suggests the young abstain from wine so as not to inflame their “wild impulses.” But he says taking a little wine as medicine or for pleasure after the day’s work is acceptable for those who are “moored by reason and time” such that they aren’t tempted by drunkenness, and he encourages mixing water in with the wine to inhibit inebriation. He also says wine [not grape juice] is an appropriate symbol of Jesus’ blood. A Psalm of David. The LORD is my shepherd; I shall not want. He makes me lie down in green pastures. He leads me beside still waters. He restores my soul. He leads me in paths of righteousness for his name’s sake. Even though I walk through the valley of the shadow of death, I will fear no evil, for you are with me; your rod and your staff, they comfort me. You prepare a table before me in the presence of my enemies; you anoint my head with oil; my cup overflows. Surely goodness and mercy shall follow me all the days of my life, and I shall dwell in the house of the LORD forever. Basil the Great likewise repudiated the views of some dualistic heretics who abhorred marriage, rejected wine, and called God’s creation “polluted” and who substituted water for wine in the Eucharist. The virtue of temperance passed from Greek philosophy into Christian ethics and became one of the four cardinal virtues under St. Ambrose and St. Augustine. Drunkenness, on the other hand, is considered a manifestation of gluttony, one of the seven deadly sins as compiled by Gregory the Great in the 6th century. This article could be much more lengthy (and tedious) delving into the Middle Ages, Protestant Reformation, English Reformation, Colonial America, Methodism, and the Temporance Movement. Chabad: Can Wise Be Holy? What is Judaism’s take on alcohol consumption? At the Last Supper, Jesus and the disciples shared a Kiddush of wine. Likewise, Paul the Apostle counseled Timothy cobverning the use of wine for his stomach ands other ailments. Drink no longer water, but use a little wine for thy stomach’s sake and thine often infirmities. The kiddish is recited over a full (brimming) large cup of wine. The wine symbolizes joy and the full cup symbolizes overflowing joy and bounty. On Shabbat there should be nothing missing from total physical and spiritual completion. 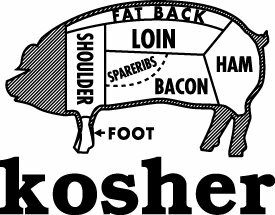 Kiddush may be recited and drunk while standing, sitting, or standing while reciting and sitting while drinking. There are a number of variations for holding the cup. Of particular note: place the cup in the palm of the right hand with the five fingers curled upward holding it. This symbolizes the five-petaled rose, the symbol of perfection, of longing for God (the petals reach upward), of the people of Israel. The text of the kiddush can be found in the siddur. The first half is an account of the completion of creation on the seventh day (Genesis 1:31 and Genesis 2:1-3). The introductory phrase va-y’hi erev va-y’hi voker–“and there was evening and there was morning”–is said in a low tone. This allows the emphasis to fall on the first four words of kiddush: “yom ha-shishi. Va-y’khulu ha-shamayim (Friday), “the sixth day. The heaven and the earth were finished”the first letters of which form the Tetragrammaton, the holy four-letter Name of God. After this we recite the blessing over the wine. The second half of the kiddush recalls both the Creation and the Exodus from Egypt, the paradigm for all physical and spiritual redemptions and rebirths, and concludes with the blessing on the sanctification of the Shabbat. If wine is not available, the kiddush can be recited over the twin hallot [braided breads]. Simply substitute the blessing over the bread for the one over the wine. Throughout the Torah, we are reminded of the great spiritual significance of wine in the life of a Jew. In fact, the Talmudic Rabbis saw fit to establish a special law with special regard to wine. Today, the vast majority of wines on the market are unfit for consumption by the kosher consumer. Throughout all the stages of wine production, the strictest Kosher supervision is required until the final stage of the actual bottling. There is, of course, the prohibition concerning wines which relates to the status of boiled wine. Kosher wine that has been cooked before contact with a non-Jew has occurred is exempted from the injunction. This prohibition stems from the historical perspective that boiled wine was considered “improper” to be offered as a libation to an idol (where wines were often offered by these idol worshiping nations). Such wine, (called “Yayin Nesach“), that had been offered to an idol was prohibited for Jewish use of any kind. This was a Torah-based prohibition. In addition, there is also a rabbinic prohibition which forbids drinking the ordinary wine of non-Jews in order to reduce social contact which could lead to assimilation and intermarriage. Such wine is called “Stam Yenam“. Therefore, if a non-Jew happened to come into contact with boiled wine, the wine is still permissible for an observant Jew to drink. Many kosher wines today bear the marking “Mevushal“, that indicates that they have been boiled. Extra caution must be taken with a kosher wine that has not been previously boiled (Mevushal), lest a non-Jew or Jew who is not Shomer Shabbos should come in contact with that bottle of wine (maid etc.). A closed bottle, even non-Mevushal wine, may be handled by a non-Jew. In its most basic state, wine is nothing more than fermented grape juice. The processing, aging and grape type used in each type of wine provide the countless variations of wines available on the market today. As we have stated, the basic initial ingredient in wine is the grape, which consists of water, sugar, acid and tannin. The most popular types of grapes used in kosher wines today are carignam, grenache and semillon. Today, the vineyards in Israel consist of over 40,000 acres and produce over 13 million gallons of wines per year. Currently, kosher wines are being produced in such places as Spain, Italy, New York, California, Israel and Italy. Besides the vital knowledge that the kosher consumer must have when purchasing wine for the enjoyment of the wine itself, it is also imperative for the kosher consumer to realize that often, wine and grape juice are used to flavor and color other food and beverage items (i.e. beer, pink lemonade, lite canned fruits, tropical drinks, cereals, etc.). Therefore, it is imperative for the kosher consumer to rely on competent Hashgachas when purchasing such complex items. The Tanakh (Old Testament) was revealed to us by God (YHWH) and often was written as a shadow of a new and better things to come (typology) which would be provided by the B’rit Chadashah. (New Testament). Any true scholar of Scripture would concur to this fact. The Apostle Paul wrote, “Study to shew thyself approved unto God, a workman that needeth not to be ashamed, rightly dividing the word of truth” (2 Timothy 2:15 KJV). Unfortunately, many believers never have read the Tanakh and consequently have no foundation for understanding the B’rit Chadashah. They often discount the Tanakh as the “Old Testament” and reject many of its teachings with the attitude that the B’rit Chadashah has replaced the Tanakh and somehow has made it obsolete. Approximately thirty-three percent of the prophecies in the Tanakh have not been fulfilled yet, so how can it be old? Approximately eighty-five percent of the B’rit Chadashah is quoted from the Tanakh, so how can it be new? The Bible is a book of eight covenants and every Word is alive and relevant for yesterday, today and forever (Hebrews 13:8). The passage about the Children of Israel and the Bronze Serpent (Nehushtan) in the Book of Numbers is symbolic of Yeshua HaMashiach (Jesus Christ). The Apostle Paul wrote, “Christ hath redeemed us from the curse of the law, being made a curse for us: for it is written, Cursed is every one that hangeth on a tree: That the blessing of Abraham might come on the Gentiles through Jesus Christ; that we might receive the promise of the Spirit through faith” (Galatians 3:13-14 KJV). In the third chapter of the Gospel of John, we find Yeshua having a conversation with a man named Nicodemus. Nicodemus was a Pharisee and a member of the Sanhedrin. He was someone who knew the Tanakh very well and it was obvious to him that there was something special about Yeshua. Unfortunately, he didn’t know enough to be able to see Yeshua as the Messiah. This was not due to some deficiency in Yeshua. It was because there was a deficiency in Nicodemus’ understanding of who the Messiah was supposed to be and what he was supposed to accomplish. So Yeshua gave him an example he should have been able to understand. Jesus answered and said unto him, Art thou a master of Israel, and knowest not these things? Verily, verily, I say unto thee, We speak that we do know, and testify that we have seen; and ye receive not our witness. If I have told you earthly things, and ye believe not, how shall ye believe, if I tell you of heavenly things? And no man hath ascended up to heaven, but he that came down from heaven, even the Son of man which is in heaven. And as Moses lifted up the serpent in the wilderness, even so must the Son of man be lifted up: That whosoever believeth in him should not perish, but have eternal life. The Children of Israel were complaining about the manna (food descending from heaven) was because it was not a perfect food. It met their needs, but it did not meet the human desire for variety. Purely spiritual food may have lacked a certain earthiness, and this may well have been at the core of the complaint. So when the Children of Israel complained about manna, God reminded them that the things that are purely from the earth (like serpents) are not good in themselves either. Snakes are the creature least able to elevate themselves. As a result of the serpent deceiving Eve in the Garden of Eden, the serpent is the animal that was brought the lowest. Unlike kosher animals, serpents make full contact with the earth. Venomous snakes remind us that lots of natural (earthly) things are in fact very bad for our health. Humans are the only ‘animals’ on the planet that walk fully upright. This is also a shadow of what we need to try to accomplish during our lives, to ascend to heaven. If we see a snake elevating on a pole, we perceive a fortiori argument. If a snake can ascend, then surely we can as well. We realize that if we try to aspire to greater heights, then God will be willing to play an active role in our lives, and change the natural progression of things. God is willing to meddle with nature, but we must first understand that our relationship with God does not come about because we are in harmony with the earth, but because we are striving for a relationship with Him. The Bronze Serpent had no healing properties whatsoever. It did nothing to save the Children of Israel that had been bitten in the wilderness by venomous serpents. It was an object of faith. By looking at the Bronze Serpent that Moses made and lifted up on pole, the Children of Israel acted on their faith in God’s instructions that were revealed to Moses. This emblem (a brozne serpent raised on a pole) is distinctive in that Yeshua the Messiah personally applied it to Himself. The more you examine it, the stranger it appears. Brass was the Levitical symbol of judgment and brass was the metal that was associated with fire (as the brazen altar, etc.). 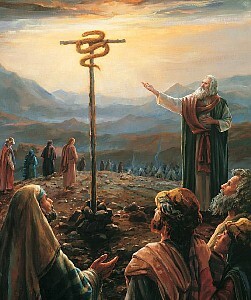 The serpent was symbolic of sin, introduced in the Garden of Eden. This is a strange emblem, indeed, for the Savior of mankind. The deadly serpent is transformed into an emblem of healing and life, just as the death that came in the Garden of Eden was defeated by the gift of eternal life offered through Yeshua’s atonement on the cross. There is only one way we can assure that we will satisfy our goal of ascending to heaven. That way, the one and only way, is through faith in Yeshua the Messiah. Jesus saith unto him, I am the way, the truth, and the life: no man cometh unto the Father, but by me. If ye had known me, ye should have known my Father also: and from henceforth ye know him, and have seen him. The Apostle Paul wrote, “That if thou shalt confess with thy mouth the Lord Jesus, and shalt believe in thine heart that God hath raised him from the dead, thou shalt be saved. For with the heart man believeth unto righteousness; and with the mouth confession is made unto salvation. For the scripture saith, Whosoever believeth on him shall not be ashamed” (Romans 10:9-11 KJV). Have you completely trusted in Yeshua and in nothing else for the forgiveness of your sins? Are you relying on Yeshua and Him alone for your righteousness, for your safety, your forgiveness, or are you putting even the smallest bit of your works before God as part of the reason you are to be saved? If you are relying in anyway on your efforts, then you are in great danger of damnation, if you’re redeemed at all. Righteousness before God does not come by your efforts, but through the sacrifice of Yeshua. If you could get to earn eternal life through righteousness, then there was no need for Yeshua to die on the cross and make atonement for our sins (Galatians 2:21).. Almost every modern translation of the Holy Bible have the phrase “Thus he declared all food clean” or something very similar added to the end of Mark 7:19. From this one verse (Mark 7:19) the majority of Christendom has come to the conclusion that all animals are now clean as food and that the dietary laws (Kashrut) in the Torah have been invalidated by Yeshua. Nothing could be further from the truth. Now let’s look at Mark 7:19 in the King James Bible which say, “And when he was entered into the house from the people, his disciples asked him concerning the parable. And he saith unto them, Are ye so without understanding also? Do ye not perceive, that whatsoever thing from without entereth into the man, it cannot defile him; Because it entereth not into his heart, but into the belly, and goeth out into the draught, purging all meats?” (Mark 7:17-19 KJV). When comparing Mark 7:17-19 in the English Standard Version and the King James Version. It becomes quite clear that a line has been added to Scripture. Even the popular “Got Questions Ministries” misinterpreted this passage in Mark to say all foods are clean. I am not knocking “Got Questions Ministries” in any way. Usually, they are a fine resource with lots of valuable and useful information. There are also serious contextual data involved here, it wasn’t what Jesus’ disciples were eating, it was that they were not following the Pharisees custom of washing their hands three times and following this cleansing with a ritualistic prayer before eating. Then came together unto him the Pharisees, and certain of the scribes, which came from Jerusalem. And when they saw some of his disciples eat bread with defiled, that is to say, with unwashen, hands, they found fault. For the Pharisees, and all the Jews, except they wash their hands oft, eat not, holding the tradition of the elders. And when they come from the market, except they wash, they eat not. And many other things there be, which they have received to hold, as the washing of cups, and pots, brasen vessels, and of tables. Then the Pharisees and scribes asked him, Why walk not thy disciples according to the tradition of the elders, but eat bread with unwashen hands? He answered and said unto them, Well hath Esaias prophesied of you hypocrites, as it is written, This people honoureth me with their lips, but their heart is far from me. Howbeit in vain do they worship me, teaching for doctrines the commandments of men. For laying aside the commandment of God, ye hold the tradition of men, as the washing of pots and cups: and many other such like things ye do. And he said unto them, Full well ye reject the commandment of God, that ye may keep your own tradition. For Moses said, Honour thy father and thy mother; and, Whoso curseth father or mother, let him die the death: But ye say, If a man shall say to his father or mother, It is Corban, that is to say, a gift, by whatsoever thou mightest be profited by me; he shall be free. And ye suffer him no more to do ought for his father or his mother; Making the word of God of none effect through your tradition, which ye have delivered: and many such like things do ye. And when he had called all the people unto him, he said unto them, Hearken unto me every one of you, and understand: There is nothing from without a man, that entering into him can defile him: but the things which come out of him, those are they that defile the man. If any man have ears to hear, let him hear. And when he was entered into the house from the people, his disciples asked him concerning the parable. And he saith unto them, Are ye so without understanding also? Do ye not perceive, that whatsoever thing from without entereth into the man, it cannot defile him; Because it entereth not into his heart, but into the belly, and goeth out into the draught, purging all meats? And he said, That which cometh out of the man, that defileth the man. For from within, out of the heart of men, proceed evil thoughts, adulteries, fornications, murders, Thefts, covetousness, wickedness, deceit, lasciviousness, an evil eye, blasphemy, pride, foolishness: All these evil things come from within, and defile the man. Jesus’ disciples had broken the traditions of the Pharisees and the Sadducees. They had not broke any Torah laws, nor were they eating unclean or prohibited foods of any kind. In addition, Yeshua would not change the Torah. He was fully man and fully divine, but the Scriptures point out on many occasions that He was subject to YHVH’s authority and subject to the will of YHVH. Yeshua was totally obedient to all laws and ordinances ever prescribed by YHVH. To change or abolish the Torah would have been a sin. Think not that I am come to destroy the law, or the prophets: I am not come to destroy, but to fulfil. For verily I say unto you, Till heaven and earth pass, one jot or one tittle shall in no wise pass from the law, till all be fulfilled. Whosoever therefore shall break one of these least commandments, and shall teach men so, he shall be called the least in the kingdom of heaven: but whosoever shall do and teach them, the same shall be called great in the kingdom of heaven. It is very easy to conclude that adding to or taking away from Scripture is a very serious offence in the eyes of God. Yeshua, as part of the Godhead, could have easily changed any Scriptures He wished to change, but as previously noted, He was subject to YHVH’s authority and subject to the will of YHVH. Yeshua was the only “person” to ever walk the earth and never break one commandment. If He has broke YHVH’s commandments, He would not have been divine and would not be the Messiah and Savior of the world. His blood would have been shed for nothing, and His crucifixion would have been just another Roman execution of a heretic. What does the Bible say about clean and unclean food? And the LORD spake unto Moses and to Aaron, saying unto them, Speak unto the children of Israel, saying, These are the beasts which ye shall eat among all the beasts that are on the earth. Whatsoever parteth the hoof, and is clovenfooted, and cheweth the cud, among the beasts, that shall ye eat. Nevertheless these shall ye not eat of them that chew the cud, or of them that divide the hoof: as the camel, because he cheweth the cud, but divideth not the hoof; he is unclean unto you. And the coney, because he cheweth the cud, but divideth not the hoof; he is unclean unto you. And the hare, because he cheweth the cud, but divideth not the hoof; he is unclean unto you. And the swine, though he divide the hoof, and be clovenfooted, yet he cheweth not the cud; he is unclean to you. Of their flesh shall ye not eat, and their carcase shall ye not touch; they are unclean to you. These shall ye eat of all that are in the waters: whatsoever hath fins and scales in the waters, in the seas, and in the rivers, them shall ye eat. And all that have not fins and scales in the seas, and in the rivers, of all that move in the waters, and of any living thing which is in the waters, they shall be an abomination unto you: They shall be even an abomination unto you; ye shall not eat of their flesh, but ye shall have their carcases in abomination. Whatsoever hath no fins nor scales in the waters, that shall be an abomination unto you. And these are they which ye shall have in abomination among the fowls; they shall not be eaten, they are an abomination: the eagle, and the ossifrage, and the ospray, And the vulture, and the kite after his kind; Every raven after his kind; And the owl, and the night hawk, and the cuckow, and the hawk after his kind, And the little owl, and the cormorant, and the great owl, And the swan, and the pelican, and the gier eagle, And the stork, the heron after her kind, and the lapwing, and the bat. All fowls that creep, going upon all four, shall be an abomination unto you. Yet these may ye eat of every flying creeping thing that goeth upon all four, which have legs above their feet, to leap withal upon the earth; Even these of them ye may eat; the locust after his kind, and the bald locust after his kind, and the beetle after his kind, and the grasshopper after his kind. But all other flying creeping things, which have four feet, shall be an abomination unto you. And for these ye shall be unclean: whosoever toucheth the carcase of them shall be unclean until the even. And whosoever beareth ought of the carcase of them shall wash his clothes, and be unclean until the even. The carcases of every beast which divideth the hoof, and is not clovenfooted, nor cheweth the cud, are unclean unto you: every one that toucheth them shall be unclean. And whatsoever goeth upon his paws, among all manner of beasts that go on all four, those are unclean unto you: whoso toucheth their carcase shall be unclean until the even. And he that beareth the carcase of them shall wash his clothes, and be unclean until the even: they are unclean unto you. These also shall be unclean unto you among the creeping things that creep upon the earth; the weasel, and the mouse, and the tortoise after his kind, And the ferret, and the chameleon, and the lizard, and the snail, and the mole. These are unclean to you among all that creep: whosoever doth touch them, when they be dead, shall be unclean until the even. And upon whatsoever any of them, when they are dead, doth fall, it shall be unclean; whether it be any vessel of wood, or raiment, or skin, or sack, whatsoever vessel it be, wherein any work is done, it must be put into water, and it shall be unclean until the even; so it shall be cleansed. And every earthen vessel, whereinto any of them falleth, whatsoever is in it shall be unclean; and ye shall break it. Of all meat which may be eaten, that on which such water cometh shall be unclean: and all drink that may be drunk in every such vessel shall be unclean. And every thing whereupon any part of their carcase falleth shall be unclean; whether it be oven, or ranges for pots, they shall be broken down: for they are unclean, and shall be unclean unto you. Nevertheless a fountain or pit, wherein there is plenty of water, shall be clean: but that which toucheth their carcase shall be unclean. And if any part of their carcase fall upon any sowing seed which is to be sown, it shall be clean. But if any water be put upon the seed, and any part of their carcase fall thereon, it shall be unclean unto you. And if any beast, of which ye may eat, die; he that toucheth the carcase thereof shall be unclean until the even. And he that eateth of the carcase of it shall wash his clothes, and be unclean until the even: he also that beareth the carcase of it shall wash his clothes, and be unclean until the even. And every creeping thing that creepeth upon the earth shall be an abomination; it shall not be eaten. Whatsoever goeth upon the belly, and whatsoever goeth upon all four, or whatsoever hath more feet among all creeping things that creep upon the earth, them ye shall not eat; for they are an abomination. Ye shall not make yourselves abominable with any creeping thing that creepeth, neither shall ye make yourselves unclean with them, that ye should be defiled thereby. For I am the LORD your God: ye shall therefore sanctify yourselves, and ye shall be holy; for I am holy: neither shall ye defile yourselves with any manner of creeping thing that creepeth upon the earth. For I am the LORD that bringeth you up out of the land of Egypt, to be your God: ye shall therefore be holy, for I am holy. This is the law of the beasts, and of the fowl, and of every living creature that moveth in the waters, and of every creature that creepeth upon the earth: To make a difference between the unclean and the clean, and between the beast that may be eaten and the beast that may not be eaten. Ye are the children of the LORD your God: ye shall not cut yourselves, nor make any baldness between your eyes for the dead. For thou art an holy people unto the LORD thy God, and the LORD hath chosen thee to be a peculiar people unto himself, above all the nations that are upon the earth. Thou shalt not eat any abominable thing. These are the beasts which ye shall eat: the ox, the sheep, and the goat, The hart, and the roebuck, and the fallow deer, and the wild goat, and the pygarg, and the wild ox, and the chamois. And every beast that parteth the hoof, and cleaveth the cleft into two claws, and cheweth the cud among the beasts, that ye shall eat. Nevertheless these ye shall not eat of them that chew the cud, or of them that divide the cloven hoof; as the camel, and the hare, and the coney: for they chew the cud, but divide not the hoof; therefore they are unclean unto you. And the swine, because it divideth the hoof, yet cheweth not the cud, it is unclean unto you: ye shall not eat of their flesh, nor touch their dead carcase. These ye shall eat of all that are in the waters: all that have fins and scales shall ye eat: And whatsoever hath not fins and scales ye may not eat; it is unclean unto you. Of all clean birds ye shall eat. But these are they of which ye shall not eat: the eagle, and the ossifrage, and the ospray, And the glede, and the kite, and the vulture after his kind, And every raven after his kind, And the owl, and the night hawk, and the cuckow, and the hawk after his kind, The little owl, and the great owl, and the swan, And the pelican, and the gier eagle, and the cormorant, And the stork, and the heron after her kind, and the lapwing, and the bat. And every creeping thing that flieth is unclean unto you: they shall not be eaten. But of all clean fowls ye may eat. Ye shall not eat of any thing that dieth of itself: thou shalt give it unto the stranger that is in thy gates, that he may eat it; or thou mayest sell it unto an alien: for thou art an holy people unto the LORD thy God. Thou shalt not seethe a kid in his mother’s milk. Thou shalt truly tithe all the increase of thy seed, that the field bringeth forth year by year. And thou shalt eat before the LORD thy God, in the place which he shall choose to place his name there, the tithe of thy corn, of thy wine, and of thine oil, and the firstlings of thy herds and of thy flocks; that thou mayest learn to fear the LORD thy God always. And if the way be too long for thee, so that thou art not able to carry it; or if the place be too far from thee, which the LORD thy God shall choose to set his name there, when the LORD thy God hath blessed thee: Then shalt thou turn it into money, and bind up the money in thine hand, and shalt go unto the place which the LORD thy God shall choose: And thou shalt bestow that money for whatsoever thy soul lusteth after, for oxen, or for sheep, or for wine, or for strong drink, or for whatsoever thy soul desireth: and thou shalt eat there before the LORD thy God, and thou shalt rejoice, thou, and thine household, And the Levite that is within thy gates; thou shalt not forsake him; for he hath no part nor inheritance with thee. At the end of three years thou shalt bring forth all the tithe of thine increase the same year, and shalt lay it up within thy gates: And the Levite, (because he hath no part nor inheritance with thee,) and the stranger, and the fatherless, and the widow, which are within thy gates, shall come, and shall eat and be satisfied; that the LORD thy God may bless thee in all the work of thine hand which thou doest. Some people like to claim there were no clean or unclean foods before Moses received the law from YHVH at Mount Sinai. This an obvious oversight a fallacy made by those who either do not know Scripture, choose to ignore Scripture, or a combination of their lack of knowledge and ignorance. And Noah went in, and his sons, and his wife, and his sons’ wives with him, into the ark, because of the waters of the flood. Of clean beasts, and of beasts that are not clean, and of fowls, and of every thing that creepeth upon the earth, There went in two and two unto Noah into the ark, the male and the female, as God had commanded Noah. YHVH did not have to explain clean and unclean food to Noah and his family after the deluge. Why? Because Adam and Eve and all the generations that were before Noah had been taught by their elders (which would be referred to as oral Torah today) what was clean and unclean. Adam and Eve had a very intimate relationship with YHVH until she heeded the words of the serpent and directly disobeyed God. Another passage of Scripture that Christendom has distorted to justify the consumption of unclean food is the Apostle Peter’s vision. “The next day, as they were on their journey and approaching the city, Peter went up on the housetop about the sixth hour to pray. And he became hungry and wanted something to eat, but while they were preparing it, he fell into a trance and saw the heavens opened and something like a great sheet descending, being let down by its four corners upon the earth. In it were all kinds of animals and reptiles and birds of the air. And there came a voice to him: “Rise, Peter; kill and eat.” But Peter said, “By no means, Lord; for I have never eaten anything that is common or unclean.” And the voice came to him again a second time, “What God has made clean, do not call common.” This happened three times, and the thing was taken up at once to heaven. Now while Peter was inwardly perplexed as to what the vision that he had seen might mean, behold, the men who were sent by Cornelius, having made inquiry for Simon’s house, stood at the gate and called out to ask whether Simon who was called Peter was lodging there. And while Peter was pondering the vision, the Spirit said to him, “Behold, three men are looking for you. Rise and go down and accompany them without hesitation, for I have sent them” (Acts 10:9-20 ESV). Peter three times stated “Not so, Lord! For I have never eaten anything common or unclean (Acts 10:14). Then in (Acts 10:15) God says “What God hath cleansed, that call not thou common”. Such a statement proves that the dietary law was still in effect after the resurrection. Then Peter went down to the men which were sent unto him from Cornelius; and said, Behold, I am he whom ye seek: what is the cause wherefore ye are come? And they said, Cornelius the centurion, a just man, and one that feareth God, and of good report among all the nation of the Jews, was warned from God by an holy angel to send for thee into his house, and to hear words of thee. Then called he them in, and lodged them. And on the morrow Peter went away with them, and certain brethren from Joppa accompanied him. And the morrow after they entered into Caesarea. And Cornelius waited for them, and had called together his kinsmen and near friends. And as Peter was coming in, Cornelius met him, and fell down at his feet, and worshipped him. But Peter took him up, saying, Stand up; I myself also am a man. And as he talked with him, he went in, and found many that were come together. The real revelation of this vision and the events that follow are brought into complete focus in the next verse. Peter says, “Then Peter went down to the men which were sent unto him from Cornelius; and said, Behold, I am he whom ye seek: what is the cause wherefore ye are come? And they said, Cornelius the centurion, a just man, and one that feareth God, and of good report among all the nation of the Jews, was warned from God by an holy angel to send for thee into his house, and to hear words of thee. Then called he them in, and lodged them. And on the morrow Peter went away with them, and certain brethren from Joppa accompanied him. And the morrow after they entered into Caesarea. And Cornelius waited for them, and had called together his kinsmen and near friends. And as Peter was coming in, Cornelius met him, and fell down at his feet, and worshipped him. But Peter took him up, saying, Stand up; I myself also am a man. And as he talked with him, he went in, and found many that were come together. And he said unto them, Ye know how that it is an unlawful thing for a man that is a Jew to keep company, or come unto one of another nation; but God hath shewed me that I should not call any man common or unclean. Peter’s statement in Acts 10:28 indicates that the divine disclosure reflected only a teaching about people, and not one about food. Peter realized the puzzling vision could not be annulling God’s instructions. In retrospect, Mark 7:17-19 (with the addition that states “thus he declared all foods clean”) is spurious at best, but also places man’s authority over the authority of the Word of God. What you eat isn’t going to determine your ultimate destine in Heaven and Hell. However, I have a major bone to pick with anyone who intentionally perverts the Word of God for their own sanctification. Some animals are clean and meant to be food for us, some are unclean and were never intended for human consumption. Pastor Jim Staley at Passion for Truth Ministries has done an audio teaching called “To Eat or Not to Eat: Does God Care About What We Eat” which is available at the following link.